The New York Times has been abuzz of late with articles suggesting that a long-ago missing child case may have finally been solved. 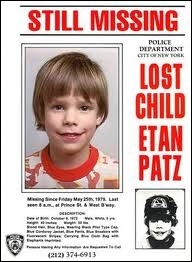 Thirty-three years ago, six-year-old Etan Patz disappeared while walking the 1½ blocks to his school bus stop. Acting on a tip in this now cold case, police investigators recently dug up a basement located on Etan’s route, looking for a body. They did not find one, but another tip led them to Pedro Hernandez, who has confessed to the boy’s killing, claiming he lured Etan into a bodega basement, strangled him, and put the body in a bag that he placed curbside with other trash. Mr. Hernandez has not been charged: his story is convincing, but he seems to have neither a motive nor a history of violence or pedophilia. It is well-known that some people will confess to horrible crimes that they did not commit, and indeed there have been other false “confessions” in this very case. Why is it that there is such intense interest in such an old case? Missing child cases are undeniably tragic, and every decent citizen wants to see a world where things like this do not happen. We lawyers, though, especially those of us concerned with child protection, are charged with coming up with sensible policies to keep kids safe, and it is no easy task. Etan’s case is remembered and pursued more than three decades after his disappearance precisely because the case touched a nerve with the populace and led to policy and behavior changes both large and small. Some of these changes have been good, others are more questionable. It is important to remember that most kids who are missing from home have not been abducted and harmed by strangers as Etan apparently was. The vast majority of missing juveniles were taken by other family members, often in conjunction with disputes over child custody after a parental divorce or separation. Other cases, especially those involving older juveniles, may involve a child running away or voluntarily leaving in the company of someone the parents consider risky or even dangerous (such as an older, drug-using friend). Reliable statistics are hard to come by, but one set of FBI statistics from the year 2000 indicated that only approximately 5% of child disappearances were likely stranger abductions or kidnappings. Of course, even five percent is too many abducted children, and nightmare cases like Etan’s have led to prompt public notifications of missing children on radio and television, pictures of missing kids on milk cartons, and organizations devoted to helping missing kids and their families, such as the National Center for Missing and Exploited Children. These are all good changes and, indeed, most children are eventually reunited with their families largely as a result of public awareness and coordinated law enforcement efforts. There have been other changes in individual behavior, though, that have produced more mixed results. Parents have become much more fearful in the past few decades, and more watchful parenting is only sometimes a good thing. On the one hand, it is much less likely that a child will be abducted by a malevolent stranger if said child never leaves the house unattended by mom or dad. On the other hand, these same children will get less fresh air, exercise and peer social interaction than did children of prior times. While my similarly middle-aged friends and I remember walking home from school and riding bikes far and wide when we were kids, few parents today accord those privileges to their own offspring. If parents are at work during their children’s after school hours, kids either go to structured programs or remain at home doing homework, watching TV and playing video games. This introduces dangers of a different sort. Sedentary lifestyles and excessive screen time may be related to increasing rates of childhood obesity and its attendant health problems. Indeed, recent news reports have also discussed higher rates of diabetes in children and adolescents, a trend almost certainly due in part to changes in diet and exercise patterns among kids. It seems we have exchanged one dire risk for another. Ultimately, we need to face the fact that there are oh-so-many things from which children need protection, and that neither laws nor individual parents can infallibly guarantee child safety in our dangerous world. It is hard being a parent, hard being a child, and impossible to come up with perfect child protection strategies. But of course, it is important that we all keep trying. Individual child abductions are terribly sad affairs in all the ways Professor McMullen thoughtfully underscores, but the image of the missing child has also become a trope of sorts. Like other tropes, the image of the missing child has symbolic cultural meaning. Perhaps in this regard the missing child trope speaks to contemporary society’s pervasive sense of lost innocence.